3 July 1916: Entered the Army as a Fahnenjunker in 1. Großherzoglich-Hessisches Feld-Artillerie-Regiment Nr.25. 29 October 1916: In the field with Field Artillery Regiment 25. 15 November 1917-10 December 1917: Detached to the Maubeuge Artillery Firing School. 18 February 1918: Signals Officer on the staff of Field Artillery Regiment 25. 1 April 1919: Transferred to Reichswehr Light Artillery Regiment 18. 2 October 1919: Transferred to Reichswehr Artillery Regiment 11. 15 May 1920: Separated from the Army. 1 February 1923: Reactivated in the Army with rank of Leutnant in Artillery Regiment 1. 1 October 1923-15 August 1924: Detached to the Artillery School. 1 October 1924: Detached to the Artillery School, Detachment B. 1 October 1928: Transferred to Artillery Regiment 7 and detached to Transport Battalion 7. 1 February 1929: Transferred to Transport Battalion 7. 15 October 1935: Chief of the 1st Company of Observation Battalion 19. 6 October 1936: Commander of Observation Battalion 9. 1 February 1937: Commander of the Observation Demonstration Battalion. 3 October 1939: Consultant in the Artillery Department of the General Army Office/Army High Command. 3 February 1941: Army High Command Leader Reserve. 3 July 1941: Leader Reserve in Army Group South on the Eastern Front. 18 September 1941: Delegated with the leadership of Panzer Artillery Regiment 19 of the 19th Panzer Division on the Eastern Front. 20 January 1942: Commander of Mountain Artillery Regiment 82 of the 7th Mountain Division in Finland. 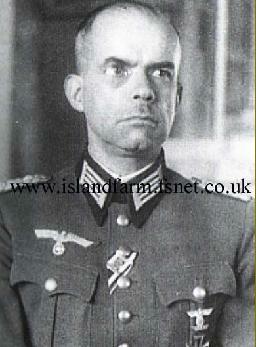 12 September 1943: Mountain Artillery Commander (Gebirgs Arko) 109 of the XXXVI Mountain Army Corps commanded by General der Infanterie Karl Weisenberger in Finland. 8 May 1945-21 May 1948: Prisoner of war in British captivity.